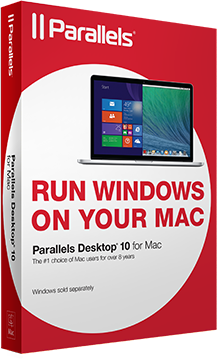 Parallels Desktop 10 for Mac is the virtualization solution that is the most powerful and flexible for users who need regular access to many apps on both Windows and Mac from a single machine without rebooting. From PC-only games to productivity software, Parallels Desktop 10 for Mac has you covered. With full support of Windows 7 with its AERO graphics, Windows 8 as well as older versions of Windows, Parallels Desktop 10 for Mac is optimized for Mac OS X Mountain Lion and will be optimized for Mac OS X Mavericks. Mac OS X Mountain Lion and Lion features like Launchpad, Mission Control and gestures work in Windows applications, making them feel like they were made for Mac. Parallels Desktop includes a feature called Coherence Mode, which hides the Windows desktop while displaying Windows applications. Windows still runs in the background, but is hidden from view. Windows applications appear in the Mac Dock, letting you switch between them without using the Windows interface. Isn’t that cool? When no Windows applications are open, Parallels Desktop will pause, thus taking up very little system resources. Parallels Compressor is a feature that automatically compresses and defragments the virtual disk while you work for better performance. Enhanced! Virtual Machine wizard makes it even easier to create new virtual machines, especially if your Mac doesn’t have an optical drive.